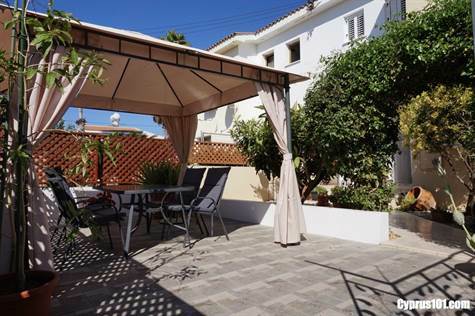 Kato Paphos townhouse, Paphos – This spacious 3 bedroom terraced home is conveniently situated in a popular residential cul-de-sac close to both Paphos Town and the touristic area of Kato Paphos and is within walking distance to amenities. The ground floor accommodation includes a spacious living room, guest toilet, fully fitted kitchen and large understairs storage cupboard. The open plan living room features a comfortable lounge nicely separated from the dining area by a decorative display cabinet. Sliding patio windows off the dining area provide easy access to a rear courtyard garden. The separate kitchen is well equipped with white fitted units, matching shelving unit and plenty of worktop space. Appliances include built-in oven, electric hob, fridge/freezer and washing machine. There is also direct access from here to the rear leisure area. A marble staircase leads up to a large master bedroom with en-suite shower room, two further double size bedrooms and a modern family size bathroom. All bedrooms have fitted wardrobes. There is further outdoor space to the front of the property including a private landscaped garden and large terrace with gazebo – ideal for outdoor dining and entertaining. For those looking for a permanent and/or holiday home in a quiet neighbourhood near to the many amenities of Paphos, this is an ideal opportunity. The property comes fully furnished and has title deeds. Kato Paphos Townhosue Property information.